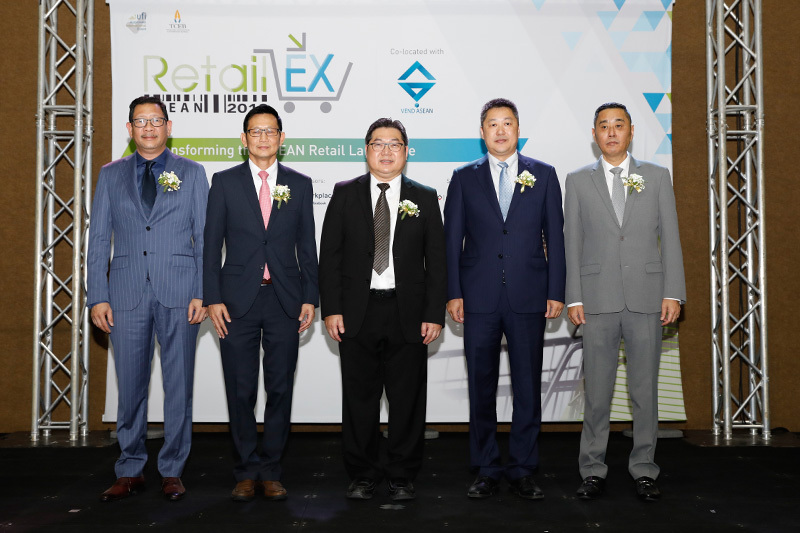 RetailEX ASEAN 2018, an annual international trade exhibition and conference that caters to retailers and brands focusing on the ASEAN market, was recently held at IMPACT Exhibition and Convention Center, Bangkok. The event was co-organised by the Thai Retailers Association, together with Clarion Events and IMPACT Exhibition Management Co., Ltd., and supported by the Thailand Convention and Exhibition Bureau. Themed Transforming the ASEAN Retail Landscape, the event welcomed 70 exhibiting brands and 3,600 industry players from over 30 countries. Over 100 speakers shared their expertise and insights on the latest retail trends through the keynote speeches, panel discussions and workshops. Photo shows (from L to R) : Mr. Puripan Bunnag, Director of TCEB’s President Office Department; Mr. Auttapol Rerkpiboon, President, Marketing Association of Thailand; Mr. Worawoot Ounjai, President, Thai Retailers Association; Mr. Yu Enze, President, Asia Pacific Vending Association; and Mr. Loy Joon How, General Manager, IMPAC­­T Exhibition Management Co., Ltd.